Japanese military intelligence during the Second World War is an important topic infrequently investigated in-depth by western scholars. In particular, training for and the execution of Imperial Japanese clandestine operations are obscure and murky areas of study. Nevertheless, Stephen Mercado, a former Central Intelligence Agency analyst and Asia specialist, admirably assembles, focuses, and delineates a wealth of material, often Japanese-language works, to produce this insightful volume. The Nakano School, named after its location in the Nakano area in northwestern Tokyo, was founded in 1938 for the purpose of training student soldiers in nonconventional military arts, such as subversion, espionage, and guerrilla warfare, but also in the art of intelligence gathering. At the outset the small school (there were only about 2,500 graduates by 1945) struggled for funding and recognition among Japan's large military forces. Moreover, the regular Japanese army, not unlike many foreign armies of the age, held the intelligence field in low regard. Earlier in the war there were a few occasions when Nakano-trained "shadow warrior" graduates were given opportunities to demonstrate the potential of guerrilla tactics against stronger forces. For example, Nakano paratroopers captured oil fields in the Netherlands East Indies intact before Dutch demolition teams had a chance to destroy the refineries and oil fields. 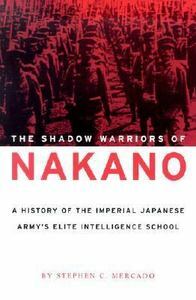 Nonetheless, only in 1943, when the war was clearly turning against Japan, did the Nakano School receive significant recognition by the Imperial Army Staff and become sought after for training commandos. Nakano graduates, although always small in numbers, carried out [End Page 274] harassing operations in Burma, India, and Okinawa, among other combat zones, and inflicted generally heavier casualties on the Allies than they themselves suffered. However, everywhere the Allies grew stronger and Nakano operatives found themselves training guerrilla units for the defense of Kyushu and Tokyo. A particularly informative chapter is titled "Ending the War, Finding New Allies" (pp. 165-99). Here the author offers a rich description of how the chief of Japanese military intelligence, Lieutenant General Arisue Seizo, used his information about the Soviet Union as a bargaining chip with MacArthur's intelligence forces. The result was a special intelligence partnership that had considerable relevance during the early rounds of the Cold War. In all likelihood, this particular Japanese-American cooperation was much more..